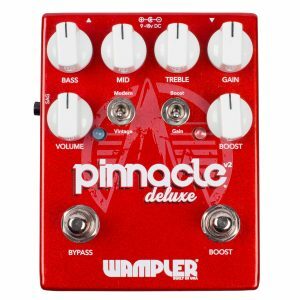 Wampler Pinnacle Distortion Pedals. “Brown Sound” Anyone? The entire range of Wampler Pedals are now available here at Scan and we are just slightly pleased to have them all here under our roof. I say slightly pleased……..as a pedal freak I’m ecstatic that these pedals are here as they are fantastic and I get to sneak off and have a play through them whenever I have some spare time! In a nutshell the Pinnacle gives you mild overdrive AND extreme gain all rolled into one beautifully built pedal and its party piece is one of the most convincing “Brown Sounds” in a pedal you will hear. In fact, Eddie Van Halen’s guitar tech Zeke Clark played through this pedal and said…. 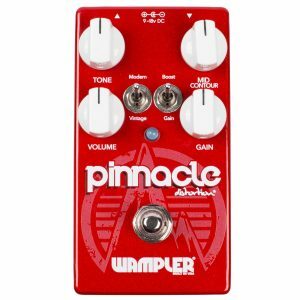 Trust me when I say if you are considering a drive pedal this has to be at the top of your list of must tries and if you love the tone but need extra versatility Wampler has got you covered on this score as well with the V2 pedal below. Full three band E.Q and a boost as well! Did I mention it does that ”Brown Sound”…grab a PAF and enjoy ! !